As hog roasting is becoming more popular, we are never surprised when residents of little towns such as Menai begin to contact us. We are experienced in catering for a wide range of events; weddings, birthdays, christenings, parties, corporate events, football matches. We find even the sight of a full roasting hog really builds morale and sets stomachs rumbling, regardless of the weather or time of year. Our menus are entirely flexible, with plenty to choose from. If you need any changes, all you need to do is ask and we will do it for you. In medieval times, the roasting of a whole hog would coincide with the entertainment of a large group of people, whether it be public holidays, feasts or the banquets of nobility. It is of no doubt however, that the same method of cooking was used at the time to cook smaller animals such as pheasant or rabbit, owing to the relatively easy preparation and cooking. Of course, back them somebody would be tasked with constantly turning the spit for hours, which for those cooking larger animals must have been a bit of a chore. Fortunately you don’t need to worry about having bulging biceps to cook a hog these days; our machines are capable of coking some real beasts of the pig world, with the motor more than strong enough to turn them for hours and cooking them perfectly. There’s no doubt that the sight of a whole roasting hog is certainly one to remember when considering hog roast in Menai. 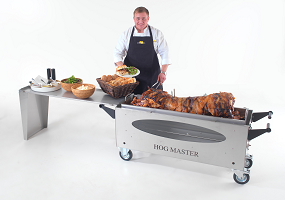 Imagine a whole roasting hog cooking slowly at the centre of your event, the mere sight of it setting mouths watering. For your party, wedding or whatever event you happen to be hosting, you can come to us for your catering assured that you will receive the best possible service and – most importantly – the best possible food. All our menus offer fantastic food options, and you can pick and choose between them; our menus in tend to show you just a taste of what we can do! All our staff are trained to food hygiene standards and we can provide you with waiting staff as well as the hog roasting chef, leaving you to enjoy your day. We will also tidy up any rubbish left behind and set out any leftover pork for you with apple sauce and bread rolls for those who are feeling hungry later. One of our most frequently asked questions is; do we cater for vegetarians? While we do specialise in hog roasting, we can cater for those with restrictive diets with our vegetarian options, just ask about our menus and buffet options. With tempting starters, delicious mains and plentiful puddings you can be sure that any vegetarians at your events will be just as full and happy as your carnivores. Perhaps for your hog roast catered event you don’t want to hire any of our trained staff, and wish to go about cooking a hog yourself? You will certainly impress your friends with your newfound hog roasting skills, and the pride of seeing all your guests tuck into delicious pork is one of our chef’s favourite aspects of hog roasting. Don’t worry if you’ve never used a hog roasting machine before; we will deliver it to you, and we can find a locally sourced pig for you if you can’t find one yourself. We can give you a hand setting it all up and we are not stingy with our roasting secrets; in fact, we are always pleased to give you hints and tips towards creating that perfect hog roast. Our hog roasting machines are incredibly versatile. Our hog roasting machines are easily adjusted for your hog roast event to cook other meats, such as chicken (up to 36 at a time) and joints of beef. The heating element is perfectly set to cook all meats perfectly and keeps it warm even as it is being served. Whether it’s served up with our sauces and vegetables, or simply in one of our warm floury buns with a dollop of apple sauce, our roasting machines make meat perfect every time. Our machines are also fully portable, with strong wheels and handles to pull it around wherever you need to go. If you are cooking inside, all you need is an open and well ventilated area. The smell of cooking pork filling the room is sure to set your guests stomachs rumbling at your event. So contact us today and let us help your event be one to remember!